Results Are In — Smalltalk Loved by Many on the 2017 Stack Overflow Survey! Opportunity Awaits — Cinovation Lab Open for Business! Event Promotion — Do You Have an Event That You Would Like to Have Promoted? Looking to Start a New Career? Polycephaly and MatriX are our solutions for utilizing the full power of your multi-core CPU and enhancing throughput, and Cincom Smalltalk product management would very much like your feedback on your use and suggestions for these frameworks. Click here to read more about Polycephaly and MatriX and to participate in the Product Management Mini Survey. The 2017 International Workshop on Smalltalk Technologies will be in Maribor, Slovenia on September 5, 2017, and a call for papers has been issued. For more information, click here. Smalltalk Loved by Many on the 2017 Stack Overflow Survey! Two years ago, Arden Thomas pointed out that Smalltalk was non-existent in the Stack Overflow survey published each year. The Cincom Smalltalk STAR Team created an initiative to make the Smalltalk community aware of the survey so that their voices could be heard. Last year the survey closed quickly, but we got a foot in the door with Smalltalk mentioned. This year, thanks to the quick reaction of the Smalltalk community, Smalltalk developers had the full opportunity to participate. As a result, Smalltalk came in at #2 in the Most Loved Software Languages category! Great job everyone! To see more survey results, click here. To help reduce friction during upgrade projects, Cincom Smalltalk’s James Savidge has introduced the Filtered Store-Code Comparison Contributed Package for Cincom ObjectStudio 8.4 or Cincom VisualWorks 7.9 and above. Click here for the article. Cinovation Lab Open for Business! For all Cincom employees, partners and business associates with promising ideas and the passion to see them through, Cinovation Lab is an ideas incubator that considers new opportunities as a possible start-up business and you as the entrepreneur. The mission is to reasonably help foster and enable the profitable pursuit and development of new opportunities for sustainable growth. To learn more, click here. Click here to see other Hidden Gems by Cincom Smalltalk Product Manager, Arden Thomas. Click here to find out how Cincom Senior Software Engineer, Jerry Kott (along with some valuable assistance from his wife, Alena) got people to stand up and take notice of Smalltalk. Not long ago, mechanical engineer, Dirk Newbold, realized that it had been 20 years since he’d been in contact with many of his university peers. However, he had no way of contacting them since his New Year’s resolution had been to delete all of his social media accounts. So Dirk decided to create a quick reunion site. But thanks to the capabilities of Cincom VisualWorks, Dirk’s simple remedy for contacting his classmates turned into much more. Click here to read the entire story. Due to a number of reasons including decreased budgets and time constraints, citizen developers are becoming more and more prevalent at a steady pace, and the Cincom Smalltalk team is definitely on top of this trend. Click here for more information on this topic including links to a couple of very interesting articles. Cincom is pleased to announce that Greg Mills, who has been serving as Vice President, International Sales/Services and Corporate Operations since August of 2015, has been promoted to the position of Corporate President. Cincom founder Tom Nies, who had been serving as President, will maintain his position as CEO and Chairman of the company. For more information about this major announcement, click here. Click here for an update on Smalltalk-related events you may want to attend. Click here to get Smalltalk news from the Cincom Smalltalk team. There are many blogs run by the Cincom Smalltalk Group now. Check them out by clicking here. Our website is a virtual goldmine with a wealth of knowledge found throughout the many pages on our site. Did you know we also have an active social media presence? Click here for more information on getting social with Cincom Smalltalk. The Cincom Smalltalk Team is extending an offer to its current users to let us assist in helping to promote their applications or services. For more information, or if you are interested in participating in this offer, click here. Do You Have an Event That You Would Like to Have Promoted? Do you have a Camp Smalltalk, Smalltalk conference or other event that you would like promoted? We can help. Click here to find out how. Looking for a particular contributed component? Find all that are available with our current product offerings here. With a goal of increasing the quality of the available system design and engineering training, providing higher-quality engineers and developers to the industry and users, and expanding the Smalltalk community, we suggest that you look into the Cincom Smalltalk Academic Program. Click here to read all about it. The Cincom Smalltalk Team has made a series of several new tutorials available. 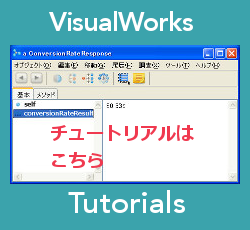 The first set of tutorials focuses on “Common Tools” and how many of these tools, which are used for development in Cincom ObjectStudio and Cincom VisualWorks, are now shared. The Cincom Smalltalk Team has launched a series of several new tutorials for introducing our products. Are you bored with the same old daily grind? Maybe your current position doesn’t present a challenge or an opportunity to show off your wide range of skills, abilities and full potential. Maybe it’s time to think about moving on to something different—something more exciting and challenging. Cincom Smalltalk is growing and improving by leaps and bounds, and you just might be a perfect fit for this team of innovative professionals. There’s no better time than the present to check it out! For more information about the positions we are currently looking to fill, or to discuss how you might contribute to our growing team, click here. Are you interested in a Smalltalk-related job? Cincom Smalltalk Support Engineer James Savidge keeps the Smalltalk community up-to-date regarding Smalltalk opportunities throughout the community. The Smalltalk Jobs Blog posts Smalltalk-related career opportunities from around the globe. Click here to see what’s available.